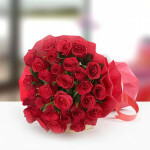 A bunch of Roses is an elegant way to express your divine love. This bouquet is a romantic way to create a memory your loved one will always cherish. The classic bunch of red Roses and fillers wrapped in a paper and red colored ribbon bow form an impressive bouquet that will enrich each moment of their day with the declaration of your love.